ca. 70 cm of textual records. -- 1 audio cassette. 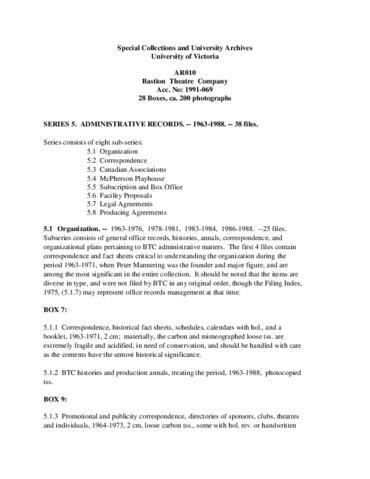 Series consists of the administrative records of the Bastion Theatre Company of British Columbia, arranged into eight series: Organization, 1963-1988; Correspondence, 1963-1988; Canadian associations, 1972-1987; McPherson Playhouse, 1963-1988; Subscription and box office records, 1971-1988; Facility proposals, 1968-1987; Legal agreements, 1975-1989; and Producing agreements, 1966-1988. Included in this series are office records, histories, annals, reports, inventories, and organizational plans; notes and a sound recording of an interview of Peter Mannering for "A History of Bastion Theatre," an M.A. thesis submitted to UVIC's Department of Theatre, by Irene Teresa Barber, 1975; architectural drawings; and legal agreements and correspondence. File 5.2.10 is located in Restricted Box 29. Access restricted. Linear extent estimated based on description.